Following a keto diet doesn’t mean you have to go without your favorite desserts. And of course, dessert isn’t complete without a flavorful, warm caramel sauce to drizzle on top. But how can you possibly make caramel sugar-free and low-carb? Traditional caramel sauce recipes are made with pure sugar or brown sugar, after all. This keto caramel recipe won’t disappoint, however. With just four simple ingredients, this sugar-free caramel sauce is the perfect addition to your favorite keto ice cream, pecan pie, or drizzle over fat bombs. And since it’s low-carb, sugar-free, and keto-friendly, you can indulge as often as you like. More research comes out every day about the importance of digestive health. Your digestion and gut microbiome play huge roles in everything from your immune health to your mood and brain function. Sweets, processed foods, and alcohol can all mess with your digestive health. Lucky for you, you don’t have to compromise your gut health just because you want a sweet treat. This keto caramel sauce isn’t just sugar-free — it’s actually good for your microbiome. Your microbiome, (aka, gut bugs) can make or break the health of your digestive tract. People with a diverse microbiome and plenty of “good” gut bacteria are usually healthier, while those with less diversity and fewer good gut bugs probably won’t thrive as much. One way you may be able to protect your good bacteria and keep “bad” bacteria at bay is by getting more of an anti-inflammatory short-chain fatty acid called butyrate. The best way to get more butyrate into your body is through food sources. Foods like butter and other high-fat dairy products have butyrate right in them. More butyrate means more protection for good gut bacteria and less of a chance that bad bacteria take over. This means, in the battle of good vs. bad bacteria, butyrate is working for the good guys[*]. Butyrate is also linked to lower inflammation and may play an anti-inflammatory role in your digestive tract[*]. Considering that a lot of autoimmune diseases are linked to gut inflammation, butyrate plays a pretty important role. If you’re feeling under the weather, you may want to consider adding some monk fruit to your diet. Monk fruit has been used for centuries in Eastern cultures as a healing herb. And it works. It contains an antioxidant compound called mogroside which has antibacterial properties and is commonly used to treat sore throats and coughs[*]. While easing a cough is always appreciated, monk fruit may have even more potent health benefits for your throat. One study found that mogrosides may inhibit the growth of cancer cells in the throat and the colon[*]. Along with antioxidant and anti-cancer properties, monk fruit may also decrease inflammation and regulate your blood sugar[*]. Much better than white sugar and brown sugar, which compromise your immune system and are linked with most diseases. Butter also happens to be a great source of fat soluble vitamins like A, D and E[*]. Vitamins A and D have a particularly important role in immunity as they help with the production and function of many different immune cells[*]. Skeptical that a caramel sauce can help you balance your blood sugar? Let’s take a look. CLA (conjugated linoleic acid) is another fatty acid found in butter. Researchers have looked at a few potential benefits of this fatty acid and found that CLA may enhance insulin sensitivity in healthy subjects[*]. Grass-fed butter is a much more abundant source of CLA than grain-fed — so make sure you’re capitalizing on your CLA by using grass-fed butter. The benefits of butter don’t stop there. The vitamin D found in butter has also been studied for its ability to improve insulin sensitivity in people with impaired fasting glucose[*]. That means that butter not only enhances insulin sensitivity if you’re healthy, but it also works if your cells are struggling to take up glucose. Aside from being an amazing alternative to blood-glucose spiking sugar, monk fruit may also play a role in blood sugar regulation. Even more so than sugar alcohols like Swerve and xylitol, which get mixed reviews when it comes to blood sugar regulation and gut health. Although researchers haven’t figured out exactly how it works, mogrosides seem to have a blood sugar stabilizing effect. This was seen in a study done on diabetic mice[*]. With very little prep time and cook time and a total carbohydrate of 1 gram per serving, this low-carb caramel sauce is the perfect keto recipe. And it tastes just like caramel candy. Enjoy this mouthwatering, low-carb caramel sauce when you’re craving a special keto dessert or you have friends and family who crave sweets. They’ll never know it’s a keto dessert! With only one net carb and abundant healthy fats, you can have your sauce and eat it too. Try it on one of these keto-approved ice creams for the perfect low-carb treat. 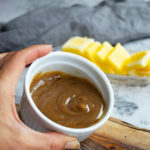 This keto caramel sauce contains butter, heavy cream, and monk fruit for a low-carb, sugar-free addition to your keto dessert. Add it to ice cream or pecan pie. Melt the butter in a small pan over low to medium heat and let it cook until it reaches a deep golden brown color. Pour in heavy cream and whisk until combined. Lower the heat and simmer for 1-2 minutes. Add in monk fruit and salt. Cook caramel under low heat until you reach the desired consistency. Feel free to store your caramel sauce in the fridge and lightly reheat when you use it.